The Context of White Supremacy welcomes Alfred W. McCoy. The Harrington Chair in History at the University of Wisconsin, Professor McCoy is an award winning historian and author. He penned Policing America’s Empire and The Politics of Heroin: CIA Complicity in the Global Drug Trade. Published in 1972, the latter details CIA involvement in global drug pedaling. The CIA reportedly attempted to suppress publication of the text. We’ll discuss his new text, In the Shadows of the American Century: The Rise and Decline of US Global Power. 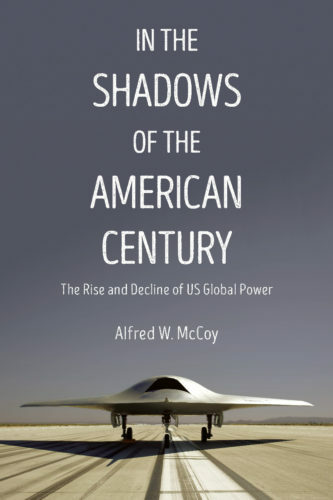 McCoy details 20th century global politics and the rise of US empire. He now predicts the rise of China and the demise of United States preeminence. McCoy doesn’t specify which people will lose power in this decline, nor does his assessment address the reported drop in White fertility rates and their percentage of the North American population. We’ll ask McCoy if the alarming rise in White opioid addiction is related to the demise of US might.